Young children who watch fast-paced, fantastical television shows may become handicapped in their readiness for learning, according to a new University of Virginia study published in the October issue of the journal Pediatrics. Researchers have identified when an important milestone in infants’ development occurs: the ability to transfer knowledge to new situations. In a series of studies, the researchers found that 8-month-olds had trouble using newly acquired knowledge in a different circumstance, but 16-month-olds could do so. 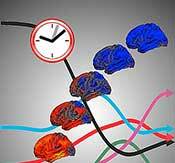 Rhythms in the brain that are associated with learning become stronger as the body moves faster, UCLA neurophysicists report in a new study. The study is published in PLoS ONE, a peer-reviewed online publication of the Public Library of Science. Check the end of this report for a link to download this open-access study.